Mariel here. Like most of the country, we’ve spent a lot of time indoors this winter. And when you have an 18-month-old, that means finding ways to entertain him using the same rolling rotation of toys, gadgets, empty bottles, cardboard boxes and kitchen utensils. It also means a lot of tantrums. While he isn’t old enough to bake, he happens to like watching me work in the kitchen. So one snowy afternoon, I set him up in his high chair and whipped up a batch of cookies inspired by a friend’s addictive contribution to our playgroup’s holiday cookie exchange. My son was happily snacking on trail mix in his chair, so I decided to add that to the batter…you know, to set a healthy example. The results were delicious…and so were the tantrum-free 20 minutes it took to make them. 1. Preheat the oven to 350 degrees. Line 2 baking sheets with parchment paper. 2. In a bowl, whisk together the flour, baking soda, baking powder and table salt. Set aside. 3. In the bowl of an electric mixer, beat the brown sugar, white sugar and butter until light and fluffy. Scrape the sides of the bowl with a rubber spatula, then beat in the egg. Lower the speed to stir and slowly add in the flour mixture until just incorporated. Remove the bowl from the mixer and fold in the white chocolate, oats and trail mix using a wooden spoon until well incorporated. 4. Dole out about 2 tablespoons of dough and roll between your palms until it forms a ball. Place on the baking sheets spacing about 2.5 inches apart since they spread. 5. Bake for 7 minutes, then rotate the sheet and bake for another 6-8 minutes, until the bottoms are starting to turn golden brown. Cool on a wire rack. 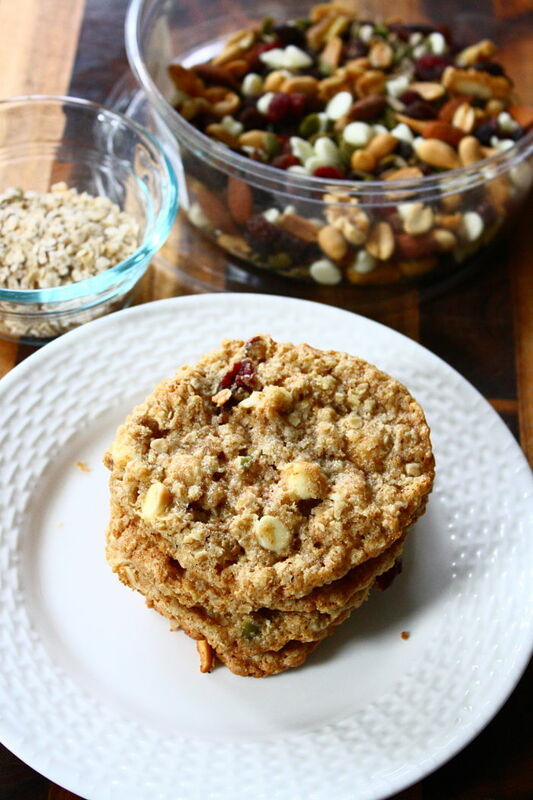 Chewy oatmeal cookies are my favorite kind of cookie – I love the idea of adding trail mix!